Ever since I was young, I never really wanted to follow the norms of being a girl. I grew up with two sisters and the choice was quite clear- Barbie dolls or dirt bikes. Obviously, I chose the latter. I didn’t stop there, though. My dad helped me expand my outdoor knowledge and hobbies with fly fishing, backpacking, kayaking, and bird hunting. Fly fishing stuck. Growing up in Wyoming allowed me to pursue my passions while surrounding myself with like minded people who encouraged and supported me. Fast forward a few years, I graduated high school and then college only to find myself on a career path I didn’t love. Somehow, my path crossed with Crazy Rainbow Fly Fishing and Ugly Bug Fly Shop. There was no looking back at this point. I knew I was where I needed to be. In training, another female guide took me in and taught me all she knew about rowing a drift boat and teaching clients to fish. This was so exciting, for at the time there were maybe a dozen women who professionally guided while rowing. Throughout my training on the water, Blake Jackson hired me to manage the Ugly Bug. Taking this position taught me what I needed to know about running a quality fly shop and guide service. Through this position, my knowledge only increased as a guide (especially as it related to tying flies and helping others select necessary gear). As of 2019, there are still less than a handful of women professionally rowing/ guiding the North Platte River- I am proud to be one of them! This season marks my fourth year as a professional fly fishing guide: Spending my days on the river with amazing clients who simply want to fish, be outside, and enjoy all that Wyoming has to offer. As a woman and a conservationist, my greatest contribution to the industry is helping change the culture of a once male-dominated sport. Encouraging other women to pursue their passions is something to be celebrated- just as those who encouraged and celebrated my endeavors. 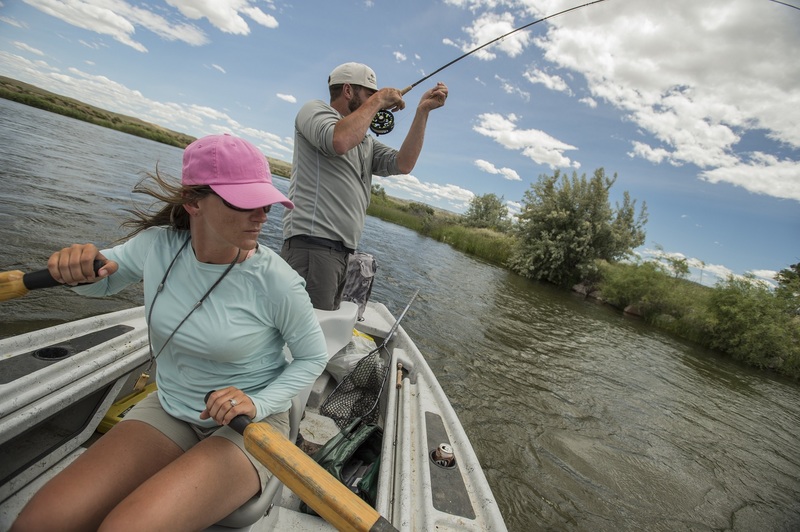 I am proud to be one of the many faces selected to promote women learning to fly fish with the Orvis 5050 on the Water Campaign. I’ve taken advantage of several opportunities to promote this industry and wonderful company. Proudly, I will continue to do so with every exciting adventure this journey offers. I am truly and gratefully surrounded by the best in this industry. Whether your a life long angler or learning for the first time, be sure to surround yourself with only the best. I hope to see you on the water soon!